Ghost’s 3rd album title leaked? Ghost’s third album is to be entitled Meliora – Latin for ‘Better’ – and it’s set for release on August 21, according to online reports. Blabbermouth says the follow-up to 2013’s Infestissumam was produced by Swedish musician Klas Ahlund, and includes tracks called From The Pinnacle To The Pit, Majesty, Devil Church, He Is and Cirice – the last expected to be the lead single, launched in the coming weeks. 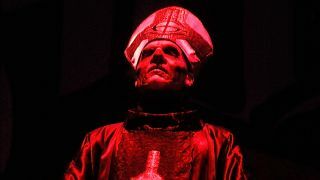 The secretive outfit last month suggested their third album would be fronted by third frontman Papa Emeritus III, said to be the three-month-younger brother of predecessor Emeritus II. But it’s thought they remain led by their co-founding vocalist. Ghost next appear at the Sweden Rock Festival on June 4. Last year one of the band’s Nameless Ghouls suggested they’d consider quitting after the launch of their fourth album.